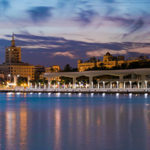 The Spanish city with the appealing name Malaga is situated on the Costa del Sol in Andalusia. It is the six largest city in Spain and has its own modern airport (Malaga airport) with bus transfer and suburban train to downtown. From there, from the Malaga train station (Estación María Zambrano) is available the high speed train “AVE” with connection to Cordoba, Toledo, Madrid and other cities. Besides the possibility of exploring the city of Malaga by car (car rental at Malaga airport) holiday makers also have available a bus station for the arrival and departure as well as for excursions. Malaga is extremely appealing geographically situated between the Strait of Gibraltar and Granada. Excursions to the surrounding mountains provide fantastic views of the Sierra Nevada. Due to this location Malaga has a very balanced climate with mild winters and pleasant warm summers. The traveler can choose among a lot of nice hotels. Depending on location some hotels offer private rooftop terraces with swimming pools and stunning views over the old town, or access to the nearby beach. The dark sand beaches stretch along 15 kilometers of Malaga’s coastline and enjoy a good reputation. Many of them are well equipped with sun loungers, parasols and sanitation. Two of them have also access for wheelchair users (La Malagueta and San Andres). Through its history the city offers the tourist a wide variety of sightseeing and entertainment. While strolling through the old city streets between the elegant stately buildings, also attract beautiful places with markets and shops offering next to the mundane also delightful arts and crafts and local cuisine. Malaga is not only known for its sweet wine, but also for ceramics and handicrafts. Malaga offers traditional Andalusian cuisine with a slight Arabic touch where are used Fish and crustaceans, mussels, but also ham and vegetables in profusion. Malaga is known for the aforementioned sweet wine, but also for its grilled sardines. Also popular are the tapas bars, where are served delicious appetizers to beer or wine. In Malaga there is a wealth of interesting buildings from the cultural heritage of the eventful history of the city. Among the particular points of interest is the birthplace of Pablo Picasso, which is also the headquarters of his foundation. There is housed a museum and a library with documents on the artist. As you see Malaga has many attractions for the visitors, and many of them would require transport. Consider checking our prices for car hire Malaga Spain and benefit from our cheap and affordable prices.